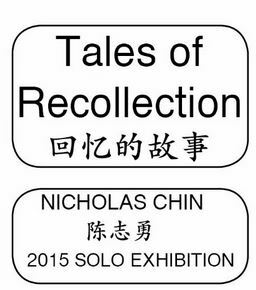 You are cordially invite you to the exhibition opening for “Tales of Recollection, by artist Nicholas Chin” (回忆的故事 – 陈志勇) on Wednesday 9 September 2015 at 6pm. This exhibition presents a selection of works by artist Nicholas Chin. Through his art, Nicholas shares impressionistic recollections and stories of his life in Malaysia, and of finding himself living in a land far from home. Influenced by Surrealism and artists Frida Kahlo and Rene Magritte, Nicholas’ art is centred around the on the themes of filial piety (the relationship between parent and child), the self, security, nostalgia, and his Malaysian-Chinese heritage, as expressed through fantasy, dreams, and symbolism. He uses motifs in his works to symbolise individuals and events; for example his parents are represented through flowers. Colours also play an important role as bridges to convey emotions and aspirations.